Ideal for enterprises and medium businesses that need a secure, highly productive, energy-efficient colour MFP.Make an impression with leading colour quality from HP. 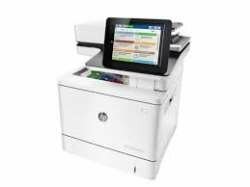 Get unparalleled printing for your office needs.Help ensure the Original HP quality you paid for with anti-fraud and cartridge authentication technology.Print right away with preinstalled toner cartridges. Replace them with cartridges featuring auto seal removal.